BEIJING — China's former world record holder Liu Xiang has easily won his third Asian 110 metre hurdle championship, posting a time of 13.50 seconds in a driving rain in the southern city of Guangzhou. The 2004 Athens Olympic champion led from the start late Thursday to win his second competition since returning from surgery on an Achilles tendon injury that kept him out of the 2008 Beijing Games. "I had hoped to run faster, but due to today's weather, it was better to be steady," Liu told journalists in a post-race interview. "I think that I'm in pretty good condition. Today I came here with a pretty relaxed attitude," he said. The win automatically qualifies Liu for next year's World Athletics Championships. Teammate Shi Dongpeng finished second, while South Korea's Park Tae-kyong won the bronze. "As long as his foot can completely heal, I believe that he can return to his peak form -- at least he should have no problem running at around 13 seconds," Liu's coach Sun Haiping told reporters. The performance was far off Liu's personal best and former world record time of 12.88 and slower than the 13.15 he ran in September when he finished second to US world number two Terrence Trammell in his first race after surgery. 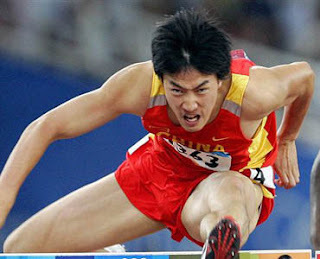 Last month, the 26-year-old won his third national 110m hurdle championship at the China Games, winning in a time of 13.34. The star hurdler will compete in next month's East Asian Games in Hong Kong before beginning winter training and preparing for the World Indoor Championships in Doha in March, Sun said. Following Thursday's race, the mega-star stripped off his shirt and tossed it into the grandstands, sparking a roar of approval from the crowd of thousands.